Though I miss a lot about Texas and Kansas, I am thankful to be back in Colorado so my kids can be closer to my parents and get to know them better. 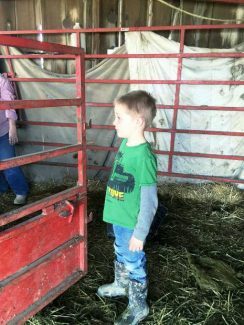 During spring break, my kids had a chance to spend a weekend at my parents' farm and they had a great time. In fact, they had so much fun that they didn't want me to come pick them up! When I came to get the kids on Monday, they were busy watching a cow that was due to calf at any time. They faithfully went out to the pasture every 15 or 20 minutes to check on her, but she never calved. 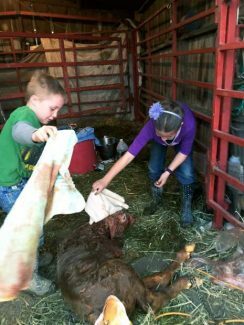 By late afternoon, I was ready to head home, but the kids were very invested in the cow and had to see her calve. I agreed to let them stay for a little longer. We waited until my dad got home from work to pull the calf. 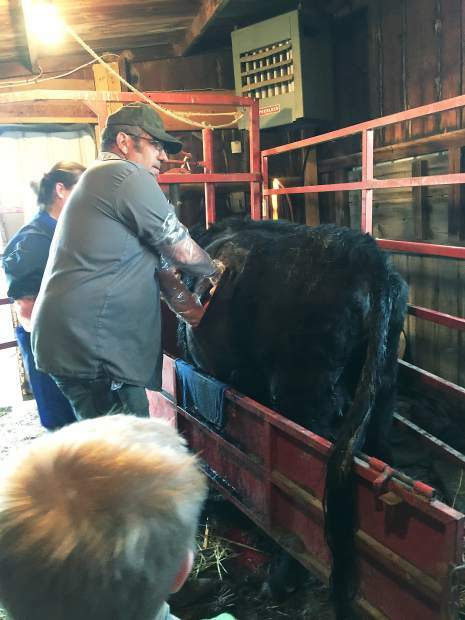 My dad pulled and pulled but couldn't get the calf out. After about 40 minutes, he called the vet. Again, the kids just had to wait and see the calf. The vet came and she tried everything that she could to get the calf out too but she couldn't get him to budge either. After pleading from the kids, I resigned to the fact that I would be driving the hour and a half home after dark and I let them stay to watch the C-section. Both kids enjoyed watching the C-section, though my squeamish 10-year-old daughter spent most of the time with her hands over her eyes, cautiously watching through her fingers. My 7-year-old son wasn't fazed by the procedure at all and eagerly watched the whole thing. » Horses don't do well with C-sections. I always thought they were like cows in this respect, but if they have to have a C-section, they have a high mortality rate. Horse C-sections aren't usually performed by regular vets. Horses are sent to specialists for the procedure. » The thread used to sew the inner layers of a cow's skin after a C-section is called cat gut thread. It is literally made out of the insides of cats. I don't think I want to know where they find all the cats to make the thread.